Record shares of young adults are completing high school, going to college and finishing college. These across-the-board increases have occurred despite dramatic immigration-driven changes in the racial and ethnic composition of college-age young adults, a trend that had led some experts to expect a decline in educational attainment. According to 2012 census data, 31% of all adults ages 25 and older have completed at least a bachelor’s degree, up from 30% in 2011. In 1971 only 12% of adults ages 25 and older had completed at least a four-year college degree. For 2012, nearly six-in-ten (57%) adults ages 25 and older had finished at least some college education. This matched the level attained in 2011. In 1971 only 22% of adults had finished at least some college. In 2012, for the first time ever, one-third of the nation’s 25- to 29-year-olds had completed at least a bachelor’s degree. Also, a record share of the nation’s young adults ages 25 to 29 (90%) had finished at least a high school education. And another record share – 63% — had completed at least some college. A high school education is becoming increasingly universal. 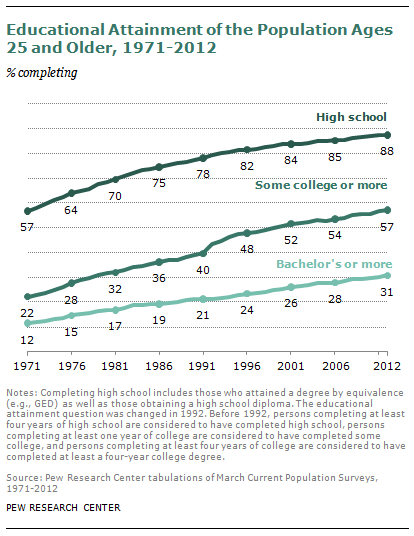 In 2012, 88% of adults ages 25 and older had at least completed high school, matching the 2011 level and far surpassing the 57% of adults who had at least finished high school in 1971.